This isn't the first time we've seen the drop-top Audi R8 Spyder. Images were leaked in early September, and we were there in Frankfurt for its official debut. That said, its unveiling at the LA Auto Show was less than climactic... other than the fact the Spyder was sporting a flashy bright-red bodywork. New hue aside, the new convertible variant is a looker from its carbon-fiber mirrors to polished aluminum wheels. The blades are gone and it has gained 476 pounds in the transformation, but the standard Lambo-derived 525-hp V10 will still rip it to 60 mph in about four seconds flat. For the details (again), we've posted the press release after the jump. Exceptional performance and breathtaking dynamism coupled with the intense sensations of open-top driving: Audi presents the R8 Spyder 5.2 FSI quattro. Its lightweight cloth top opens and closes fully automatically; several body parts are made of a carbon fiber composite material. The V10 engine produces 386 kW (525 hp) and launches the open-top two-seater to 100 km/h (62.14 mph) in 4.1 seconds on its way to a top speed of 313 km/h (194.49 mph). Featuring technologies such as the Audi Space Frame (ASF), quattro permanent all-wheel drive, full-LED headlights and with an innovative seatbelt microphone available as an option, the R8 Spyder 5.2 FSI quattro is the new top-of-the-range Audi. 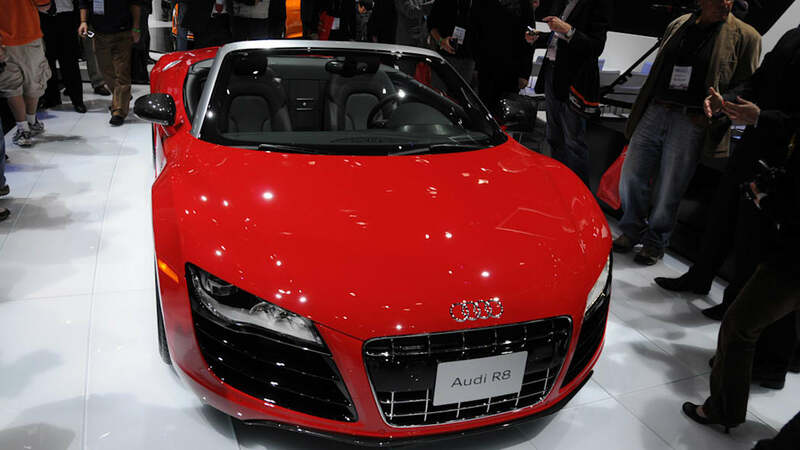 The Audi R8 Spyder 5.2 FSI quattro makes a powerful statement. The sculptured lines of the emotion-packed, high-performance sports car are a fascinating and unique interpretation of its dynamism. Unlike the Coupé, the Spyder does not have sideblades behind the doors. 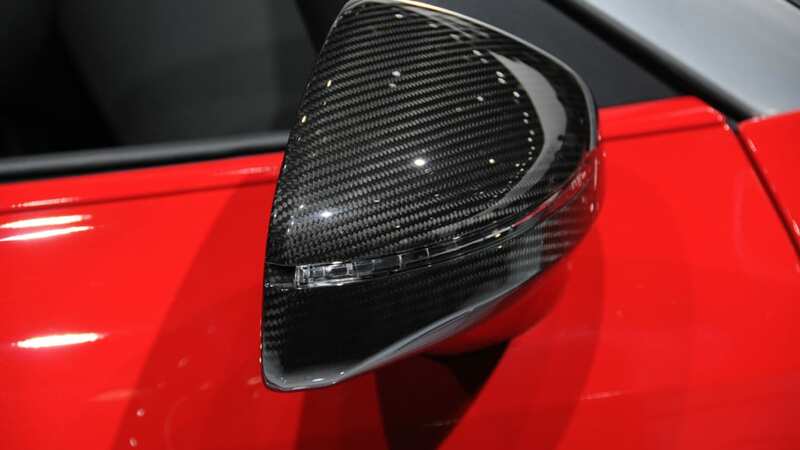 The side panels and the large cover over the storage compartment for the cloth top are made of a carbon fiber composite. Two arched cowls, which extend to the spoiler lip and include large, integrated air vents, give the rear of the open-top two-seater a powerful profile. Like every open-top Audi, the R8 Spyder 5.2 FSI quattro has a cloth top – an uncompromising solution for a high-performance sports car. The soft top's approximate weight is a mere 30 kilograms (66.14 lb); it thus keeps the vehicle's total weight and center of gravity low. The top takes up little space when open and is a harmonious design element when closed. It tapers off to two slim fins extending to the trailing edge of the car, emphasizing the elongated silhouette. The top, which comprises an outer skin of a leakproof textile fabric and the headliner, is fully compatible with high-speed driving. When driving at moderate speeds with the top up, interior noise levels in the R8 Spyder are barely higher than in the Coupé. The bulkhead includes integrated rollover protection in the form of two strong, spring-tensioned plates. Head/thorax side bags in the backrests protect the passengers in the event of a side impact. Full-size airbags stand at the ready in the event of a head-on collision. In a rear-end collision, the integral head restraint system reduces the risk of whiplash injuries. 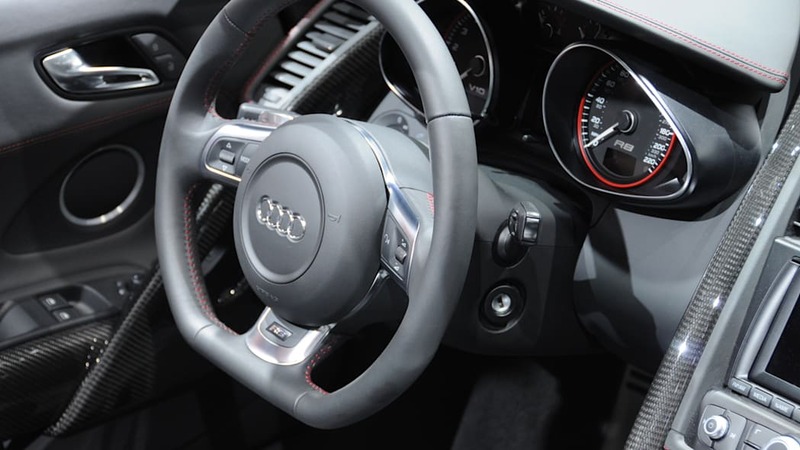 In the version with manual transmission, the R8 Spyder 5.2 FSI quattro weighs only 1,720 kilograms thanks primarily to its aluminum Audi Space Frame (ASF) body. Despite reinforcements in the area of the sills, the center tunnel, the rear wall, the floor pan and the A- and B-pillars, the body weighs only 216 kilograms (476.2 lb) – just 6 kilograms (13.23 lb) more than that of the R8 Coupé. The high stiffness of the ASF body, which includes an integrated engine frame of ultra-lightweight magnesium, provides the foundation for the car's dynamic handling and superior safety. 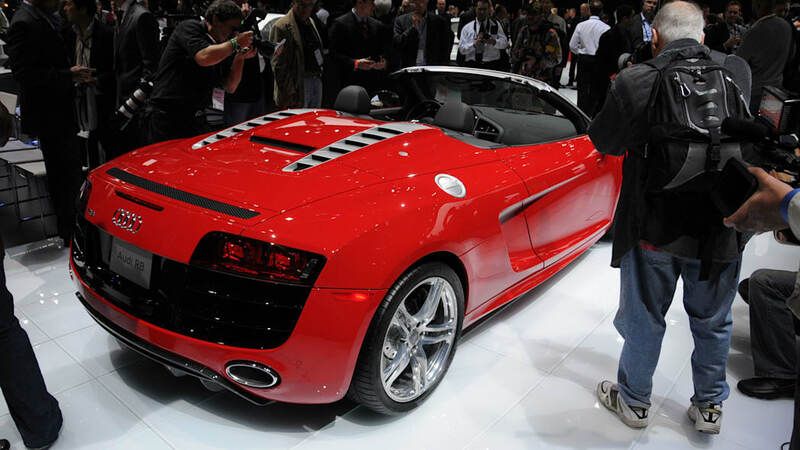 Numerous details demonstrate that the Audi designers put their hearts into the design of the R8 Spyder 5.2 FSI quattro. 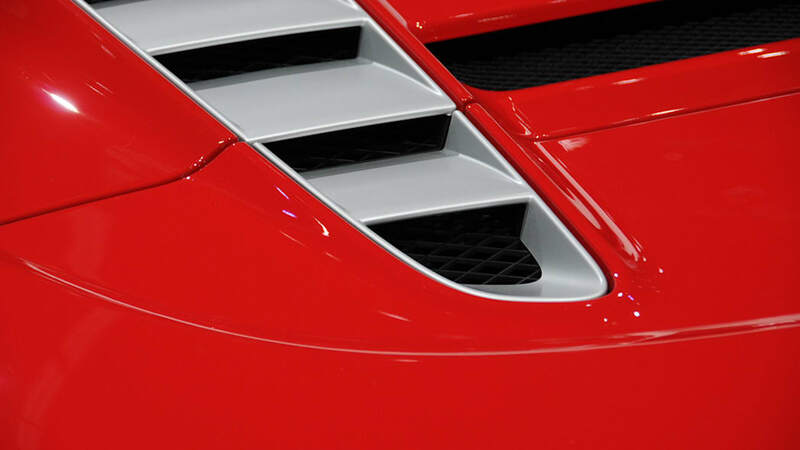 The air inlets in the nose, which direct air across the three radiators, and the lip of the front skirt are painted high-gloss black. The struts in the broad, low, single-frame grille are finely coated with chrome. The standard full-LED headlights are technical works of art. Their reflectors resemble open mussel shells; the daytime running lights appear to be a homogeneous strip, but actually comprise 24 individual LEDs that form a curve at the lower edge of the headlight. 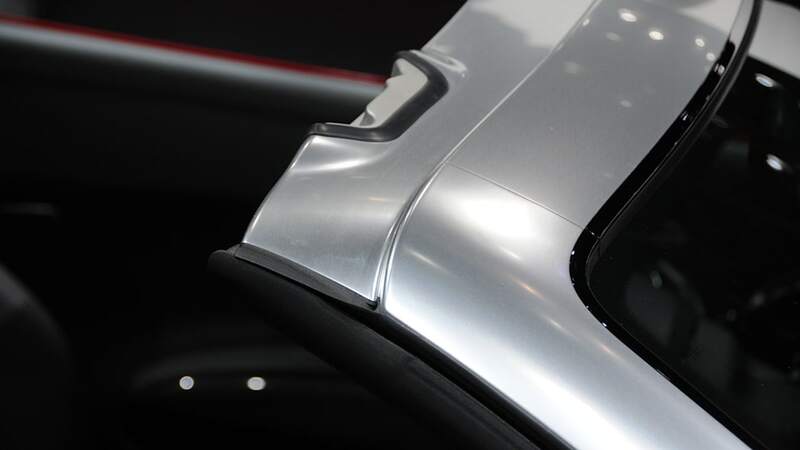 The side sills of the R8 Spyder 5.2 FSI quattro are broad and angular. 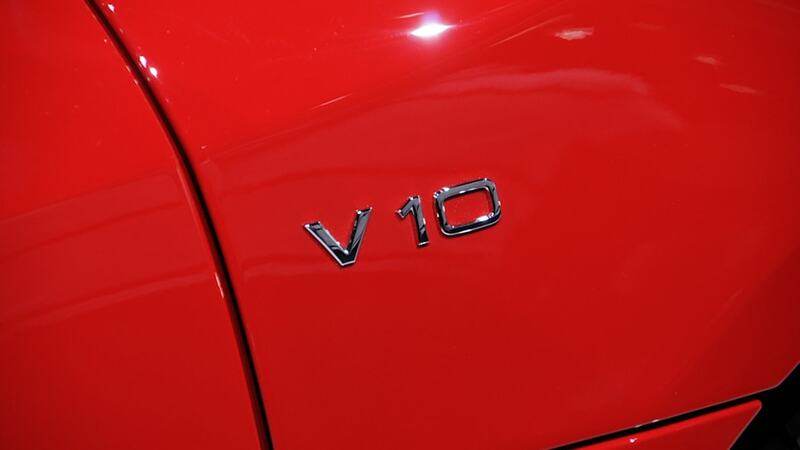 V10 badges on the flanks allude to the power of the engine. A dark surface between the rear lights emphasizes the car's width. The chambers of the lights are colored dark red, with LEDs generating a three-dimensional light pattern. 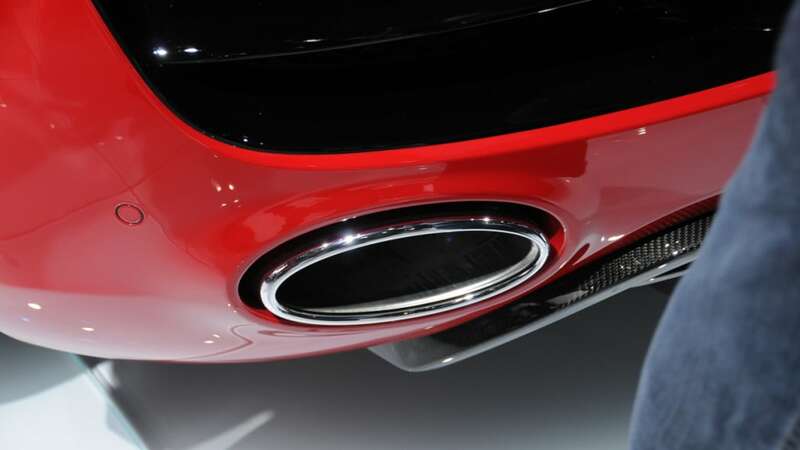 The exhaust system ends in two large, oval tailpipes, and the fully lined underbody ends in an upturned diffuser. The rear spoiler extends automatically at higher speeds. 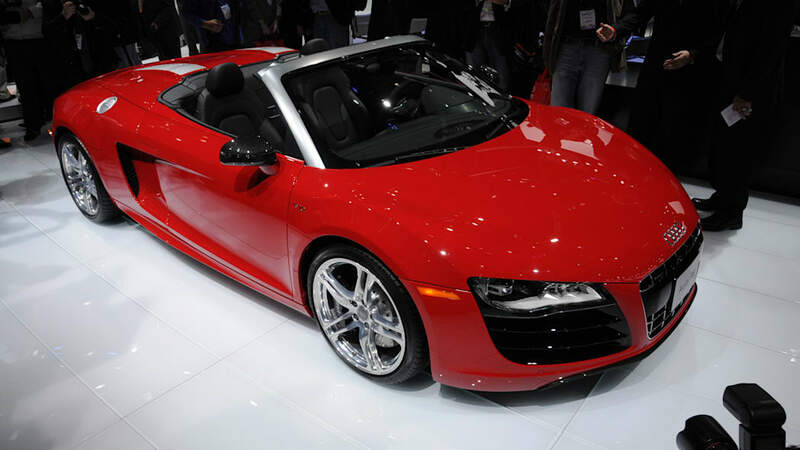 Audi offers the R8 Spyder 5.2 FSI quattro with a choice of three colors for the top. The body is available in eleven paint finishes, with metallic and pearl effect finishes standard. The windshield frame is coated with anodized aluminum. 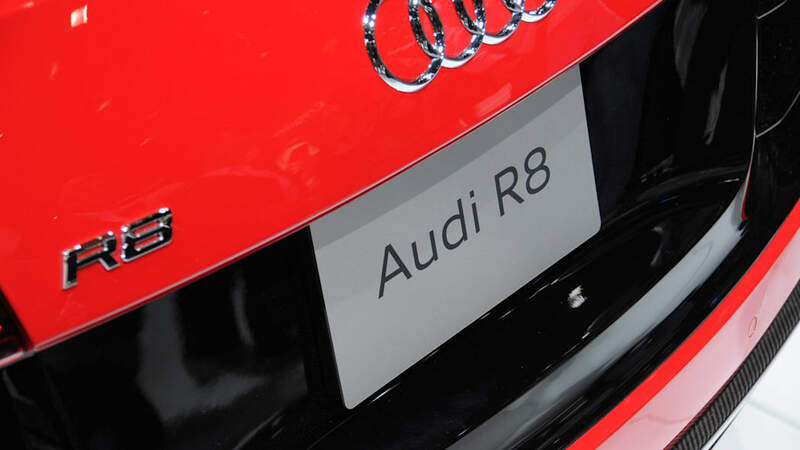 Many additional fine features documents the top status of the Audi R8 Spyder 5.2 FSI quattro. 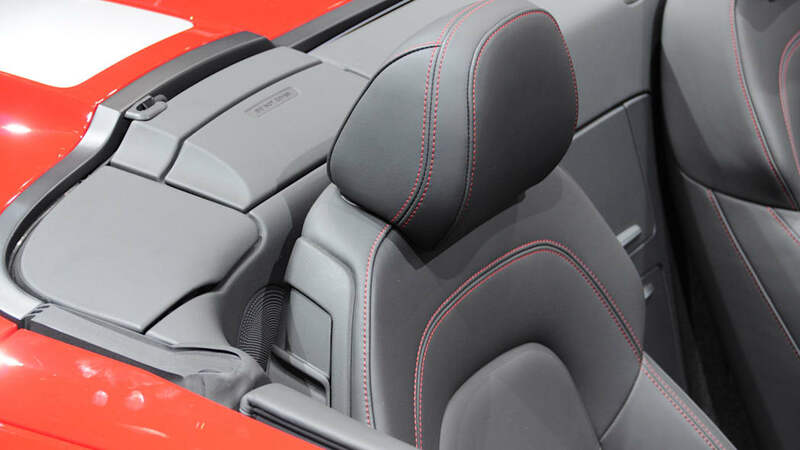 The leather for the seats are colored with pigments that reflect the infrared component of sunlight, which keeps the seats up to 20 degrees Celsius (68 degrees Fahrenheit) cooler. The latest version of the navigation system plus with MMI operating logic is also standard in the R8 Spyder 5.2 FSI quattro. It features higher resolution and particularly fast route calculation. The system's most visible new feature is the high-resolution, 6.5-inch display. The topographic view can be scrolled in any direction. The system can be combined optionally with a rearview camera that serves as a parking aid. The 5.2-liter engine features FSI direct fuel injection. The high 12.5:1 compression ratio that this enables contributes to the high performance and good fuel efficiency. 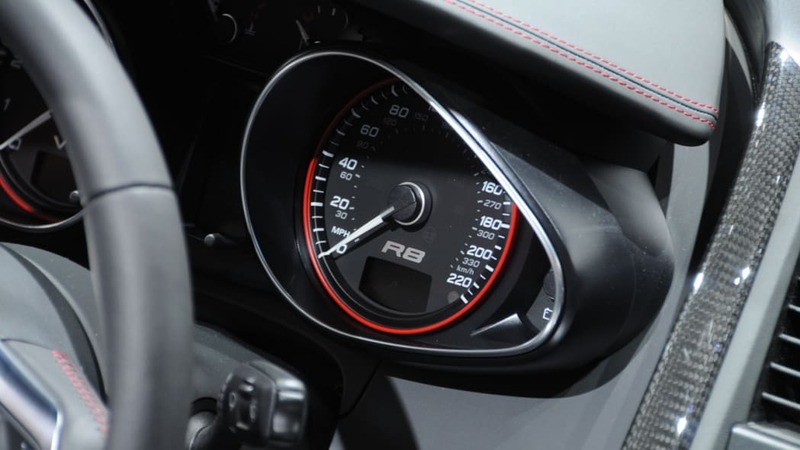 Equipped with a manual transmission, the R8 Spyder 5.2 FSI quattro consumes an average of 14.9 liters of fuel per 100 km (15.79 US mpg) – a good figure given its power. 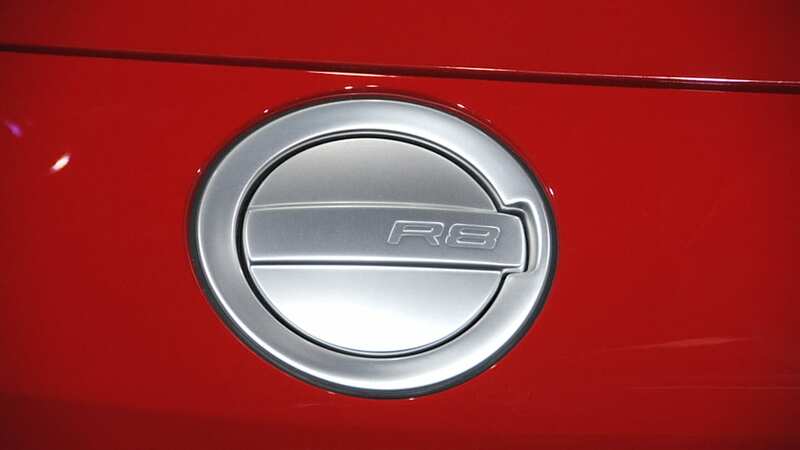 With R tronic, this figure improves to 13.9 liters (16.92 US mpg). Dry sump lubrication, another motorsports technology, ensures that the supply of oil is maintained even at the maximum lateral acceleration of 1.2 g.
The Audi R8 Spyder 5.2 FSI is also available with an optional automatic six-speed transmission. The R tronic offers a normal and a sport program as well as a fully automatic and a manual mode. The manual mode allows the driver to make lightning-fast gear changes using the joystick on the center tunnel or with the paddles on the steering wheel. 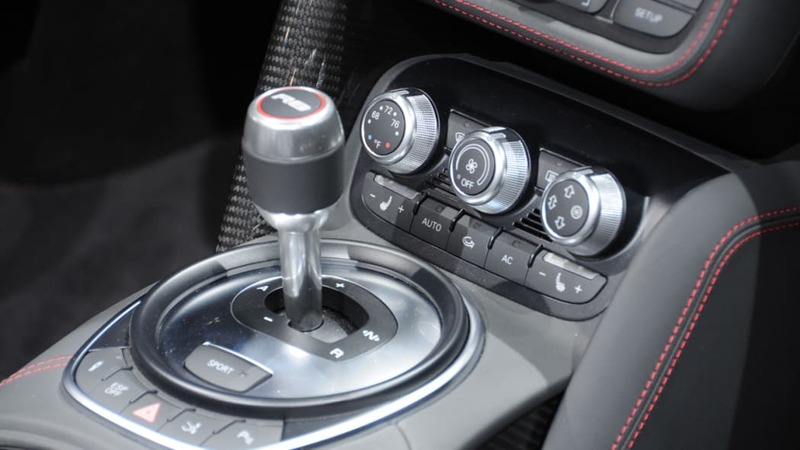 The open-air sports car also comes with "Launch Control" – a program that manages engagement of the clutch perfectly to maximize acceleration at start. The chassis is tuned for good comfort, thanks in part to standard Audi magnetic ride technology. This uses magnetic fields in the shock absorbers to adjust their response to road conditions within milliseconds and adapt to the driver's style. The driver can choose between two base characteristics. A sports suspension with conventional shock absorbers is available as an option. 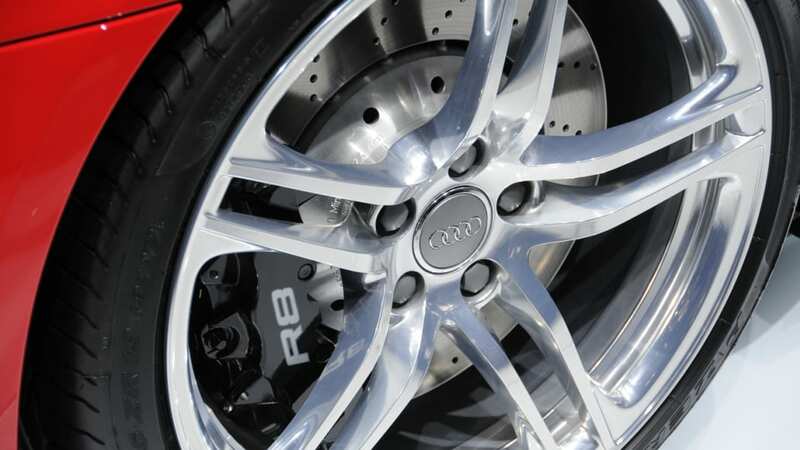 The R8 Spyder 5.2 FSI quattro rolls on 19-inch wheels of 10-spoke Y design. The front rims are shod with 235/35 tires, with 295/30 tires at the back. 305/30 tires are optionally available. The brakes offer impressive performance: The four discs are internally ventilated and perforated, with eight-piston calipers up front and four-piston calipers at the back. Optionally available from Audi are oversized carbon fiber-ceramic discs that are extremely lightweight, robust and long-lived. The ESP stabilization system has a Sport mode and can also be completely deactivated. The brake system includes an assist function that facilitates starting on gradients. 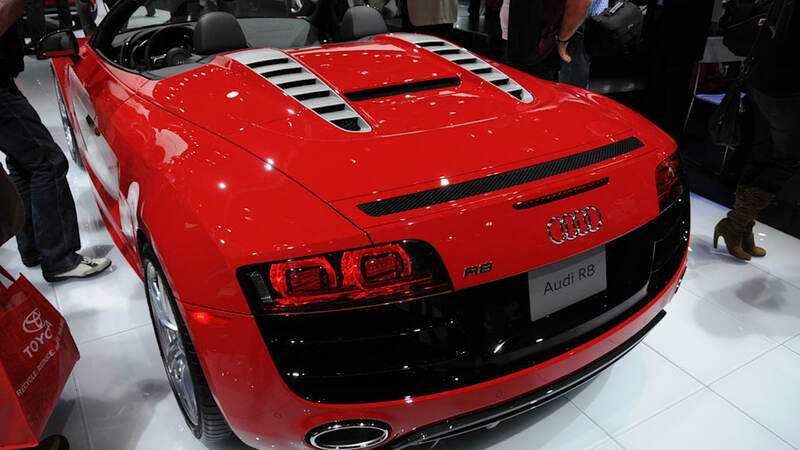 The Audi R8 Spyder 5.2 FSI quattro is built by quattro GmbH at the Neckarsulm plant. The vehicle, including the ASF, is largely hand-built. The open-top two-seater will be launched in Germany in the first quarter of 2010.